RNZ reports that the auction website has handed over the personal and trading details of nearly 45,000 of its most frequent users to the IRD. The tax department issued Trade Me with a legal order demanding the details of customers. But Trade Me’s trust and safety manager John Duffy said he refused IRD’s original broad-brush request for information. He said ordinary sellers were not included in the new request. He said it was only right commercial users pay tax and he was not worried about an impact on business. Well that is all very fine but I consider this an extreme example of IRD over-reach. The IRD should have no right to seek and search innocent people, be they Trade Me users or whoever. The only time they should have access to this data is if they are conducting an investigation into any individual user. And then requests for information should be confined to that individual. This National govt won’t do anything about these kind of bureaucratic over-reaches and abuse of power. It doesn’t give one damn for the protection of our privacy. 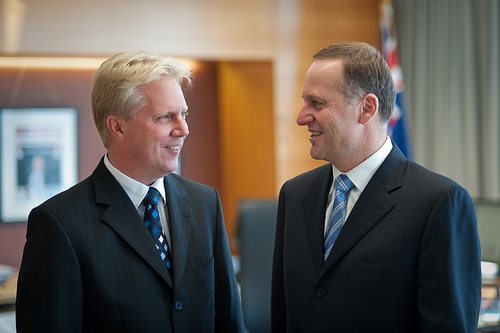 Minister Todd McClay is a weak and compliant big govt crony who only listens to cardigan wearing bureaucrats and not the citizens of NZ. HE STANDS FOR NOTHING..! I so desperately wish there was a voting choice out there that would undertake to start curbing the power of out of control bureaucracies and not pandering to them as National does. I think the correct term to describe what is going on is “Fascism”. The merging of State and big business into one. Charged with not paying Tax. Guilty until you prove yourself innocent. IRD have been going on fishing expeditions forever. The Police have started also asking for more and more information without a warrant, and more importantly getting it. The richest New Zealanders, outside of property investors, are no longer TAX resident in New Zealand. As the screws tighten more people at the higher end will opt out of NZ and the bottom end will opt out of working. The only surprising thing is that more people have not opted out. The burden for those left in the middle is rising. Take out the non productive sector that is growing, public servants who basically do not do anything productive ,but do get in the way of the productive sector. We are on a slippery slope and no option but to ride it to the bottom. Look at the likes of Greece and the other PIGGS, look hard because the media and Government do not want you to see it.